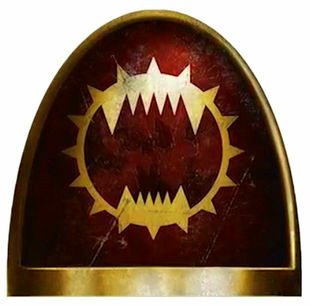 While people are, of course, free to paint their models however they wish: in whatever passes for canon in the mutable 40K background, the Devourers may reasonably be agreed to have worn red armour with brass and bronze trim. There’s a couple of caveats and disclaimers in there, but the weight of evidence seemed very much to support that conclusion, and I stand by it. (In any case, I’m very happy with how I painted mine). While researching that post, I of course looked through the old Horus Heresy – Collected Visions artbook in search of evidence. I didn’t find any pictures of the Devourers, but there were lots of pictures of Angron, like this one on page 226 of Collected Visions (or in the book Visions of Treachery, if you have the separate editions). It was pointed out to me by a helpful chap with the moniker Son of Russ that, if you look closely, the caption for that image is actually “Angron’s Bodyguard”! The corresponding game card (shown on page 382) is even more specific, being named “Devourers – Angron’s Bodyguard”. But this picture was so similar to the artwork for Angron himself (see for example the picture on page 231), that I had simply assumed it was him and hadn’t looked closer. It seems that (in the view of this artist at least) the Devourers were so desperate for Angron’s validation that they didn’t only wear armour in his colours, but modified their very faces and skulls to look as much like him as they could. So, there’s one thing we can absolutely, unquestionably conclude, without argument: there is definite solid evidence, in the canon, in a GW-approved publication, in support of painting your Devourers in brass armour. (I’d rather like to see someone go the whole hog and convert a whole unit of Space Marines to look just like Angron, as in the image above). So if you’ve painted yours like this guy has, you are supported by the “fluff”. Is that the end of it, then? Was my previous conclusion simply wrong? I’d say not, actually. And not because (as a vile troll on the otherwise-excellent World Eaters Facebook group tried to insist) I feel any burning need to be “right” – I wouldn’t even be writing this post if that were all I were concerned about. Rather, it’s that (as the quote at the top of this post hinted) Warhammer 40,000 has always been flexible in canon, being often unclear and sometimes outright contradictory. This is especially true for the Horus Heresy, which started out as a short piece of “colour text” to fill an empty quarter-page in the First Book of the Astronomicon, then was used as an explanation for why the game Adeptus Titanicus used the same models for each side (in different coloured plastic – the real explanation being that GW couldn’t afford to make more than one sprue), and has grown over the following 30 years to now include nearly 60 novels, dozens of short stories and audio dramas, seven campaign books and an entire line of models. Any claim that almost any part of it has remained whole and unchanged since its inception would be laughable. In any case, it seems clear to me that this artwork is in open contradiction with other sources. This artwork shows a Devourer in brass artificer Terminator armour. The novels describe the Devourers as wearing red and brass Cataphractii Terminator armour. The first Forge World book clearly shows a “Devourer” shoulder pad coloured red with brass trim, and moreover it’s a power-armoured pad. In fact, the picture in Collected Visions, and the shoulder pad shown in Betrayal, are basically diametric opposites – so it’d be intellectually dishonest to claim that either is definitive. Well… all of them, at different times, or depending in which you choose to put the most weight. Is artwork for a third-party game in 2000 compiled into a GW publication in 2004, more convincing in your opinion than a piece of art for Forge World’s first Horus Heresy book in 2012? Does either carry more or less weight than the Black Library book Betrayer, written by arguably the best author in the Horus Heresy stable, Aaron Dembski-Bowden; and how mightily does that weigh compared to the much more detailed descriptions of the Devourers, but given by a much less talented author, in a short story featured in a recent event-only anthology? Do any of those “correctly” capture some perfect prototypical vision, conceived whole and entire by Rick Priestley and Alan Merrett chatting in a pub in Nottingham some time in the mid-1980s, or were they then – and to at least some extent, are their replacements now – making it up as they went along? Caveat emptor, frankly. I leave it up to you. People are, of course, free to paint their models however they wish. In what passes for canon in the mutable 40K background, there is clear support for Devourers in either brass custom Terminator armour with red features, or red Cataphractii Terminator armour with brass trim. How someone chooses to interpret the available lore, in their own army, is up to them. Anyway… what really matters is BLOOD FOR THE BLOOD GOD. Recently I painted a Terminator Command Squad for my Horus Heresy World Eaters army (plus attached Legion Champion), which you can see in the photo. I’m super pleased with how they turned out, especially the banner, which used no fewer than five transfers. I got a very positive response when I shared that photo, with people being largely complimentary about what I’d produced, which is always nice to hear. There were a few people though, who made comments like “I was surprised to see so much red” – not (in most cases) critical or negative, but confused. This rather took me back. Of course, World Eaters at the beginning of the Heresy wore mostly white and blue – which is how I’ve painted the rest of my army; but as far as I was aware, it had been well-known since… well… forever, that Angron’s bodyguard, known as the Devourers, wore red and brass Cataphractii Terminator armour. (It’s also well known that Angron despised the Devourers, being offended by the very idea that he might need a bodyguard, and annoyed that they were too slow to keep up with him in battle). Now, however, multiple people were saying that the Devourers were supposed to be armoured in brass, with red shoulder pads only. Of course, a pretty simple rule of thumb is that people can paint their models however they wish – they are, after all, their models (and in historical gaming, the kind of pedants who say things like “<nasal whine> I think you’ll find </nasal whine> that there should be six buttons on his shirt and you’ve only painted five” are known dismissively as “button counters”… don’t be a button counter). But surprised as I was by the number of people who held the same belief, and in the spirit of clearing up confusion among World Eaters enthusiasts, I decided to do some digging. First, I sought to confirm what I thought I knew myself. 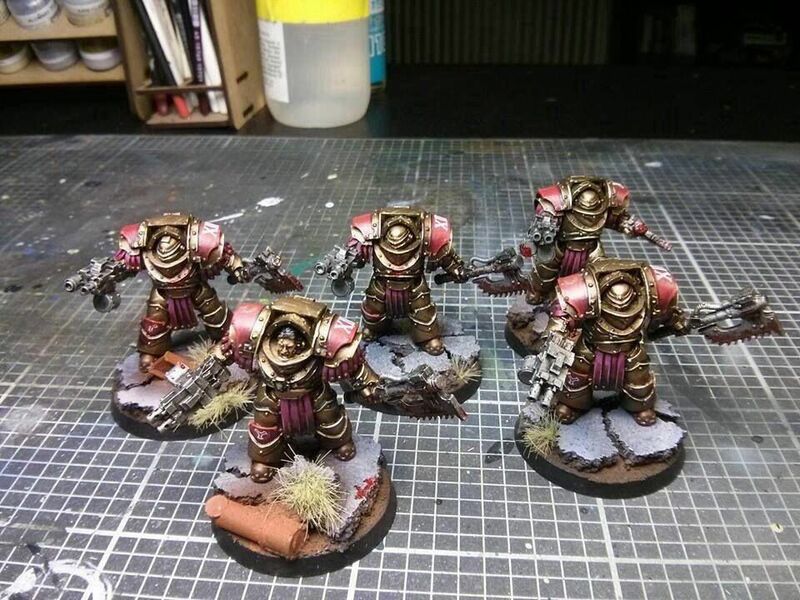 Right back from way before Black Library and Forge World brought the Heresy to life, everyone knew, didn’t they, that the Devourers wore red and brass? Well, I couldn’t actually find anything to support it in any of the GW-published books I’ve got (including the old Realms of Chaos books, the World Eaters entry in Index Astartes, Collected Visions, or any White Dwarf article). The usual reference sites like Lexicanum or 40K Wikia were either silent on the matter, or in some cases, simply wrong (for example showing artwork of a “normal” World Eaters Terminator in white and blue, but captioning it as a Devourer). So where had I got that impression from in the first place? I’m still baffled by this – and if anyone is aware of such a source, please let me know! That artwork… doesn’t actually help much, unfortunately. Firstly, it’s clearly a power-armoured shoulder pad, not Cataphractii Terminator, so it’s not obvious how it fits in with the information available about them elsewhere. Secondly, while when I first saw it I took it to confirm my assumption that Devourers wore red armour with brass trim, it doesn’t actually contradict other people’s claims that they wore all-brass except for red shoulder pads… because it only shows a shoulder pad. Having drawn a blank on original sources, and not much more than that in the newer FW/BL HH stuff, perhaps it’s time to look closer at why people had decided to take the opposite view, that they should be all brass/bronze except for red shoulder pads? I did a bit of exploring and found that none of those who had done so seemed to provide any justification based in a published source for their choice (and a very rude person on the Facebook group refused to even try to find a source, saying instead that he just knew he was right, even while continuing to insist I was not just wrong but an idiot). Again – people may obviously paint their models as they wish; and in most cases, it simply seems that they decided to paint Angron’s so-called “bodyguard” in brass because Angron’s own armour is usually painted brass, and they wanted their models to match. That’s understandable, but it doesn’t answer the wider question. Once again, if anyone is aware of a published source that would support an all-brass scheme for Devourers, please do let me know. This all left us at something of an impasse. I am immensely pleased with my own models in red, and others seem to be quite pleased with their own models in brass; and after all, they are each our models, and (to really emphasize the point!) people may paint their models as they wish. But it still seemed strange, that we all seemed to think “everyone knew” what Devourers were supposed to look like, yet none of us seemed able to provide a source to confirm it. So I remained intrigued, but the question remained open. As a new release, it can’t retroactively make anyone’s previous beliefs or opinions “wrong”. Until we find an older source, we can only say that the new information matches or contradicts one or other previously-held opinion. Previous stories about Angron, Kharn, and the Conqueror were mostly written by the exceptionally talented Aaron Dembski-Bowden (with an honourable shout out to Matthew Farrer for the excellent After Desh’ea, and a few others have contributed too). This new story is written by LJ Goulding, on whose capabilities as an author I’ll decline to venture an opinion. As former Black Library loremaster for the Horus Heresy, he ought to know his stuff… however… given that he appears not to have even bothered to read Betrayer before writing Prince of Blood (the final non-epilogue scene in Betrayer sees Ivar Tobin dead on the bridge of the Conqueror, pinned to the deck with a girder through his chest; in Prince of Blood, set a few weeks or months later, Ivar Tobin is alive and well – for at least a few pages until he dies for a second time), it’s dubious how much weight Goulding’s word should carry. It’s always frustrating as a reader to find that you care about the characters more than the author does. Say it with me: “people may paint their models however they wish”! So. There’s new information in this new story, which may potentially answer the question going forward, but which can’t make anyone retroactively “wrong”, and which is of dubious worth anyway. But what does it actually say? Red and brass and bronze – that wraps it up, doesn’t it? Nobody would describe World Eaters armour as blue and white, they’d call it white and blue; you start with the colour covering the largest area, that’s how English works. Question resolved! Ah. Red (and brass and bronze) armour can hardly be said to be “in imitation” of the primarch’s armour, which was brass (and bronze and red). The second half of the sentence appears to contradict the first half of the same sentence. So it’s still unclear! Emphasis mine. This would seem to be the information we need to finally lay the matter to rest. Khârn, like the Devourers (or else he wouldn’t have felt the need for a disclaimer), now wears red and brass and bronze, the colours of Khorne. So to know whether that means mostly red with brass and bronze trim, or mostly brass with bronze trim and red shoulder pads, we simply need to look at some artwork and models representing Khârn. In my view, that pretty much draws a line under things (bearing in mind the caveats previously given). While people are, of course, free to paint their models however they wish: in whatever passes for canon in the mutable 40K background, the Devourers may reasonably be agreed to have worn red armour with brass and bronze trim. I’d still be fascinated to see an older published source saying this, though. I must have missed it somehow. Sorry, it’s not the best photo – I really should have used another lamp and a diffuser, but I couldn’t be bothered to set up the whole lighting rig. Mainly, of course, because I still intend to take photos of the whole army – both on a white background as above, and on terrain – when I get a spare hour or so. I initially planned for the eye lenses to be blue, just like the plasma, but that really wouldn’t have worked (“have they got plasma in their heads?”). I also planned to do a full gem effect on the eye lenses. But I started, and realised the lenses are all tiny, even smaller than a normal miniature gem. I could still have done it, but you’d never have noticed it and these are tabletop quality models, not for display, so why bother? So they’re just a very simple purple ink glaze over silver. The plasma is a bit more involved, because the outlets are so much larger: four shades of blue, plus gloss varnish. It hasn’t turned out quite how I expected it would, but still does the trick quite nicely I think – the layers of blue stand out very obviously in the photo but on the model itself, you only notice it if you look really closely. Again, thoughts of OSL (which I’ve never actually tried) were rejected when I reminded myself that the army is plenty tabletop ready now, and they look plenty good enough without it. So there it is, finally: a finished Ghar (not just “finished-enough-for-the-campaign-day”). I think they look really cool, and I’m already planning what to work on next. When I magnetised Fartok’s arms, I took them from a standard Battle Suit kit. This meant that I then had a Battle Suit with no arms lying around doing nothing. Well, I mused to myself: Fartok’s rebellion must scrounge armour, weapons and equipment from wherever they can find them. That being the case, an armless suit would make a really good objective – something worth fighting a battle over. So that’s what I decide to use it for. I need to make two more of these, actually. The Hold the Line scenario needs three objective markers. I’ll make them later. So I had a bit of a hobby comedown after the Xilos Campaign Day, but in the last week or two I’ve finished off a few more Ghar. Fartok, leader of the Outcast Rebellion, here equipped with standard battle-suit weaponry (he’s been magnetised to optionally instead be able to take his own custom weapons, as I showed in a previous post). As well as being the coolest Ghar in Antarean space, as a High Commander, Fartok unlocks Support and Strategic slots in the army list – so if I take him, I don’t need a Command Crawler. Sounds good to me. Fartok again, this time representing the temporary embarrassment of having had his battle-suit destroyed. I need to find an Algoryn player with whom to play the Run, Fartok, Run! scenario. And finally, a second Bomber squad – Fartok unlocks access to them, so why not? So I now have a couple of different 1000 point Ghar lists I can use (one with Fartok, the other with a Command Crawler). Although they’re all painted to an acceptable tabletop standard, my next step will be to add final details to them – specifically, helmet lenses and glowy bits. Once I’ve done that I’ll take some better photos of the army in situ, with scenic backdrops. After that… I’m not yet sure. I could either stay with Antares and Ghar for a while, and assemble and paint more Outcasts and Black Guard to be able to field a genuine Rebel force (especially with some new weapons teams released in December); or, I could go for something completely different. I’ve had a squad of Horus Heresy-era World Eaters sitting on my painting desk for months now, I’d like to get those finished. I have a whole bunch of 40K Orks that need painting too, so they’d be another option. Or maybe something else – lately I’ve been glancing at Napoleonic British, Napoleonic French, Alexandrians, several Horus Heresy Primarchs, Zombicide, and even Fury of Dracula. I’ll go with whatever takes my fancy, basically! So I’ve written all about my gaming experience of the day. How was everything else? (Again, photos from the day have been taken from the Facebook group). Above all else the campaign day was a chance to chat with a bunch of like-minded people. The games and the discussion between them fully justified the price of the ticket. It was interesting to talk with people for their take on Antares, and some of them had come up with some really nice colour schemes for their armies – the swamp-camo’d Ghar being a personal favourite. I didn’t see any models of a Golden Demon standard, which surprised me a little – even though this was a gaming day not a painting competition, there’s usually at least one or two people whose painting is a cut above the rest. As it was, the best painted stuff on view was in the display cabinet. The venue was spacious and well-stocked with food. Most of the gaming tables looked fantastic, though not all of them were the full 6’x4′ and some of them were significantly smaller, which was a bit of a shame. It would have been better if they’d all been in one room, and it sounds like that will be the case for future events. The atmosphere was fairly informal and laid back, which was largely positive (as one chap commented, it’s not like a GW event where you’re told what to do and where to go and asked to shout “Waaagh!” at irregular intervals) but a little confusing at times too (when I arrived, I surmised from the gaming tables that I was in the right place, but there was no real formal welcome and we stood around making uncomfortable small talk for an hour or so before things really got started; like many wargamers, I’m somewhat introverted and things did feel a little awkward). A subset (or possibly superset!?) of the “people” category, a real highlight of the day for me was a chance to get to chat to the ever-genial and gentlemanly Rick Priestley. It was a genuine pleasure to talk to Rick about the Antares setting and game, his outline plans for a fantasy battle version of Beyond the Gates of Antares (“Fantares”!? ), transport vehicles (still a bugbear for me – the game’s set a million years in the future and everyone’s still walking into battle!? ), his column in WSS magazine, his legacy in Warhammer 40,000, and a whole bunch of other stuff. As if that wasn’t enough – the man himself, the legend, was kind enough to not only sign my BtGoA and Xilos rulebooks, and also his new book about wargame design, but even my beloved and well-thumbed copy of Rogue Trader too! I cannot describe to you how happy that made me. (Later, someone else asked him to sign their copy of Rogue Trader too, and I heard someone laugh as though they had made a terrible faux pas. Of course, Rick’s current focus is on Antares; of course, he’s not been involved with 40K for some time now, the rules aren’t a patch on BtGoA, and GW seem determined to make a mess of even the fluff as well. But 40K remains probably the most widely-played tabletop wargame in the world, as well as one of the most influential; its roots can be seen in Bolt Action and even in BtGoA itself. I believe Rick should be, and I got the impression from speaking to him that he is, hugely proud of 40K and what it became; and I for one am honoured and grateful that he was kind enough to sign the book that 25+ years ago, in no small way, changed my life). For a £30 ticket, Warlord surely went out of their way to make sure it offered value for money. And some miscast resin bitz, for use as objectives or terrain. Pretty fantastic value in my view; I think it’d be somewhere around £60-90 at RRP. I did raise an eyebrow at a couple of them (as the kind of dedicated BtGoA players who’d snap up an event ticket within 24 hours of them going on sale, wouldn’t most of us own the Xilos rulebook already?) but it’s all good stuff and anyway, it’s free! In my case it simply means I can give away the Xilos book and models to someone else who’s thinking of playing the game. It all helps build the community. I had a really good day. The build-up was the impetus I needed to get a complete army assembled and painted, and the event itself was highly enjoyable. While some of the scenarios were a little too complex for this kind of event (it must have been a good hour before the first game got going, as we were reading the scenario rules and playing the prequel mini-game) and the finale was a bit too much of a mess, I had fun in every game and met some very cool people. Will I go again? There’s every possibility. Xilos is a setting of particular interest to me (the discovery of the second gate was the moment the BtGoA background finally grabbed me) so depending on how the story pans out, I may or may not be a regular attendee at every similar event they put on, but I’ll be keeping my eyes open – and I am extremely impressed by what I got for the price of my ticket. I would like to see a bit more structure in how the day’s results are presented. We played four games, and I know my principal opponent in the final game got the most VPs in that scenario; but the battles were supposed to be part of a campaign, and I don’t think it was ever announced which faction had won, or how the story was panning out. I’d have liked for there to be a between-battle briefing about that, to get us invested. Apparently in the global campaign, Karg and the Ghar Empire did magnificently well (and that result will affect the future direction of the Antares setting). How did I and the other Ghar players on the day compare? It would have been nice to know. Overall though, I had a great time. I highly recommend trying one of these events for yourself. 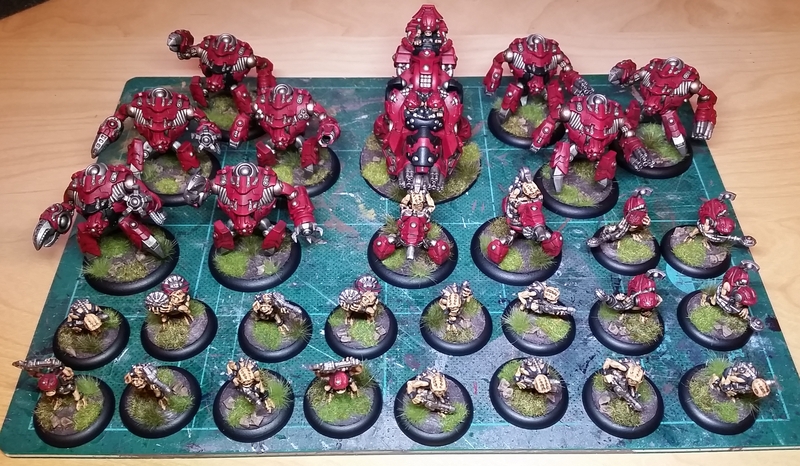 Having spent a good chunk of my spare time for three weeks getting my Ghar army together, I think it’s worth taking a look at how it performed. As described in part 1, I won one game and lost three – why was that, what could I have done differently? Let’s look at each unit in turn. (I’ll be taking better photos at some point in the next week or so too). Much as expected, really. Fairly hard to kill (notwithstanding the plasma reactor overload the very first time they were fired at! ), the choice of fire modes for their guns mean that whatever they come up against, they have a chance of doing something. The main thing I found (and this applies to the other suit units too) was that as soon as they started taking any pins at all – especially if targeted by net ammo – they take break tests so quickly that they’re forced down in no time, even if they haven’t taken any casualties. In game two in particular, my opponent was playing whack-a-mole with battle suits – force one down, move onto another, when the first one rallies go back to them, and so on. Game balance dictates that there have to be downsides for heavily-armoured units, but mechanically they feel fragile despite being hard to kill. Why should a meagre three pins have a 50% chance of taking battle suits out of the game? I know they don’t suffer pins just from being hit by low-SV shots, but it’s not like Plasma Lances are hard to come by (just three points to upgrade a Concord Strike Trooper, for example) even if the opponent doesn’t bring net ammo. I did find that Plasma Amplifiers are worth their weight in gold, though. Unit not in a good position? That’s OK, just run into a better position and do what you need to do with your second order. You may only be able to do it once or twice in a game per unit so upgraded, but it’s well worth the investment. Again, this applies to all the suit units, and the Command Crawler, too. Unlike the Battle Squad, my Assault Squad seemed to find itself with nothing to do a lot of the time. The ability to force units down by shooting them with Gougers was nearly crucial a couple of times, but in four games I didn’t see a single round of melee, with my Assault suits or anything else. (Indeed, the one time they tried to charge, the target unit simply sprinted away at 3M as a reaction, while my Assault troopers lumbered around doing nothing, wondering why they’d just given my opponent a free order dice). Unlike the pin problem I mentioned above, though, which seems to be inherent to the game system; I feel like I could get better use out of my Assault Squad if I were a better or more experienced player. Units can’t run away from a charge if they’ve already got an order dice, for example, and if other units can pin the charge target (or even force them down) the Assault Squad can make a real mess of them. I do wonder how viable that really makes the squad, though. I’m very much in favour of units having to work together in combination or exhibit synergy; that encourages manoeuvre, good tactics, and good game-play, as opposed to a unit being an OP win-button. On the other hand – at nearly a quarter of the points cost of the entire army, I’d hope an Assault Squad could present some kind of threat on its own, and I never really felt at any point during the day that they did very much. I need to play some more games, find the synergies, and re-assess them. It’s possible that this squad were my best-performing unit on the day. (Not as high-performing as a similar unit fighting for the Rebels in the final game, when fire from a bunch of Lugger Guns blew up my Command Crawler*). In the very first game, a fortuitous deployment let them form a firing line and gun down most of a Vardanari squad with rapid fire; in the third game, they were my only unit to retrieve a relic, using their numbers to form a conga line while my slow-moving battle suits lumbered around ineffectively. Unfortunately, they’re my least-favourite models in the army! Convenient for filling up points, numerous enough to do things suits can’t do, more effective in battle than you might expect due to rapid fire… they might to all intents and purposes be an essential pick in any Ghar army, but I still can’t bring myself to like them very much. A cheap option that was convenient to use as a distort dice dump a couple of times. I don’t remember if this unit succeeded in killing anything all game; if it did, I suppose it was a bonus. Not much more to say, more games are needed to decide how useful this unit really is. By far the most disappointing unit in the list. Almost the opposite of the Outcasts, in fact – I adore the model, but it seems terrible on the tabletop. It’s true that it’s almost indestructible; it took until game four before I even had to check the rules for what happens when it takes damage. (It then promptly exploded to small-arms fire*, after rolling an obscene number of 10s). Trouble is, a unit that takes up a quarter of my army and the only thing it succeeds in doing is (mostly) not dying, clearly isn’t worth the investment. The confusing thing is that all the research I’d done on Ghar beforehand suggested that people think a Crawler was a must-have – not just due to unlocking options like Bomber Squads, but in its own right. I just don’t see it. True, nearby units get a slight bonus to their Command checks (10% chance of making a difference); true, nearby units can be ordered to Follow, and I can imagine circumstances under which that would be useful (most likely when everything is somehow already in position and you just need your whole line to open fire at once). None of that is worth over 250 points. Granted, it’s MOD2 (or MOD3 when you need it, with plasma amps) but what are you going to use those multiple order dice for? Running 30″ in a turn seems like it might be useful, but what are you going to do when you get there? With just two Scourer Cannons it’s got the firepower of an under-strength Battle Squad, for double the price. I don’t get why anyone thinks that’s good. In future games, I will be using Fartok (not an option on this campaign day) to unlock Bomber Squads and be an awesome unit in his own right. The Command Crawler will remain in the box, until someone explains to me why it’s useful. Bombers are pitched as being essential for Ghar as they have the range that’s lacking in other units. I’m not sure how true that is – most other units have a 30″ range at least, and on a typical 6’x4′ tabletop that’s usually plenty. Only once in four games, I think, was one of my units out of range of what it needed to shoot at; most of the time shooting took place within a 20″ effective range. Nevertheless, the Bomber Squad was pretty handy. OH fire opens up options for getting past things like batter drones, and the blast allows a good number of hits to be inflicted. Disruptor for double pins was useful too. I’m not sure that this unit blew my socks off, and it would clearly be much more effective if you could have the Leader and/or any additional models armed with Bombers too, but it did OK. Nevertheless, a dirt-cheap unit, where models move as individuals, that grants bonuses to the rest of the army, and can be used as a distort dump if required? Yeah, hard to see how that’s going to be anything other than a good thing. Get Up! – Given the comments I made above about pins and battle suits being forced down, it will come as no surprise to learn that this came in really handy. Of course, even if the unit gets recovers from going down, it’s likely still to have lots of pins on it and thus struggle to be effective – but this at least opens up the possibility. Superior Shard – I found this to be basically meaningless in standard games, where both armies start fully deployed; opponents will almost always have more order dice than Ghar, and losing one dice just means one of their cheap throwaway units doesn’t do anything. But, in scenarios where not everything starts on the table – or, in the end game where there’s only a few units left – this could be brutal. That’s what I found in the very first game: my opponent’s Vardanari were the only squad that landed, and use of the Superior Shard meant they didn’t even get to do anything on the first turn. It gave me a real advantage. Marksman – Forcing all dice to be re-rolled, not just the misses, means this isn’t as useful as I hoped. I took it with the intent of getting the most out of the Bomber’s single shot, but in fact, when you need a 2 or 3 to hit anyway (and might still hit something even if it scatters), a re-roll is hardly worth the bother. So I used it a couple of times in a desperate attempt to get some use out of the Command Crawler: dispersed shots from its Scourer Cannon on a fire order managed only one hit, so I re-rolled and scored… one hit. Ho hum. I’m still getting to grips with the Ghar, and it’s going to take some time. That’s OK – I like armies that need some thought to use. Perhaps the biggest thing to come to terms with is that there doesn’t seem to be much in the list that’s outright destructive. Even a full unit of battle suits letting rip with Scourer Cannons only fire nine shots, expecting roughly 4.5 hits and maybe 2-3 casualties, depending what they’re shooting at. (The Outcasts and their Lugger Guns do better statistically by sheer weight of fire, albeit it that they’re so fragile and cowardly they might not often get a chance to put that into effect). I know for sure I’ll be bringing Fartok into the list and taking the Command Crawler out. I’d intended to use the spare points for more Bombers, but I’m actually now wondering whether just more Battle Suits is the way forward. I can’t wait to play some more games and work all this out. * Note added in edit: having re-checked the rules, I think the Command Crawler should not actually have been destroyed by Lugger Gun fire after all. Heavily armoured targets only roll D5 on the damage chart, not D10 – so it should have been +1 pin and down, instead of outright destroyed. Ce la vie, I got plenty of rules wrong myself, it was an honest mistake made in the heat of tabletop action – and it doesn’t really change my thoughts on the unit. Even if it had stayed alive, it wouldn’t have done anything other than sit there soaking up fire. That’s situationally useful, but not worth over 250 points.